As a human behavior hacker, Vanessa Van Edwards created a research lab to study the hidden forces that drive us. And she’s cracked the code. In Captivate, she shares shortcuts, systems, and secrets for taking charge of your interactions at work, at home, and in any social situation. These aren’t the people skills you learned in school. 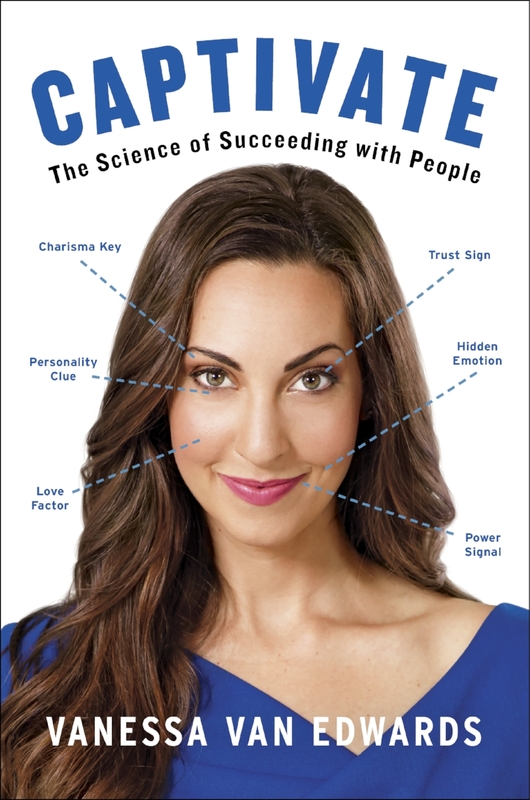 This is the first comprehensive, science backed, real life manual on how to captivate anyone–and a completely new approach to building connections. – How to work a room: Every party, networking event, and social situation has a predictable map. Discover the sweet spot for making the most connections. – How to read faces: It’s easier than you think to speed-read facial expressions and use them to predict people’s emotions. – How to talk to anyone: Every conversation can be memorable–once you learn how certain words generate the pleasure hormone dopamine in listeners. When you understand the laws of human behavior, your influence, impact, and income will increase significantly. What’s more, you will improve your interpersonal intelligence, make a killer first impression, and build rapport quickly and authentically in any situation–negotiations, interviews, parties, and pitches. You’ll never interact the same way again. I first came across Vanessa Van Edwards via a Self-Made Man podcast interview she did with Mike Dillard. If you’re curious, you can listen to that podcast here. I was immediately taken both by Vanessa’s easy storytelling style and the captivating information she was relaying. I purchased Captivate the moment I finished the podcast. I was not disappointed in reading this book. Captivate is an engaging and interactive read. Not only does Vanessa relate what she’s learned in an easy-to-digest (and apply!) way, she also encourages you to take quizzes and other actions to enrich your reading experience. During the course of the book, you will learn 14 powerful ways to hack human behavior. The book is divided into three sections, meaning that no matter what your profession or personal social challenge, you’re sure to get something of value from the book. Whether you’re the type of person who has to meet a lot of new people or someone who’s trying to enrich their existing relationships, Captivate is a must read. I can already see that this is a book that will stay on my shelf and that I’ll revisit time and again. There’s so much good stuff, it would be impossible to really get everything out of the book on a first read. I think an appropriate way to start applying the knowledge of Captivate in your own life is to pick one behavior hack at a time to focus on learning and internalizing. Each chapter features a “Challenges” section with ideas for putting each behavior hack into action. I am looking forward to trying these in my own life! This is one book that you definitely have to be opened to receiving. I’ve been introduced to the idea of The Law of Attraction before, so this was nothing new to me. But I did find her candidness and enthusiasm for the subject refreshing. I enjoyed reading her own stories and experiences she put into this book. In some ways, it almost felt like reading a memoir more than a personal development book. I have never read The Secret. But if you are looking for an introduction to The Law of Attraction, this is a great place to start. This book introduces and explains the subject and explains how to put it into practice without feeling too preachy or too woo-woo crazy. I think this is a great book that everyone should read. There’s sure to be a nugget in here that will resonate with you and motivate you to get in touch with your inner badass! I really love books like these, where the authors have managed to dig up a series of fascinating stories that they utilize to illustrate their points. It really elevates what could be a dull read into something captivating. The Power of Habit is divided into three parts: The Habits of Individuals, The Habits of Organizations, and The Habits of Society. But it really feels like the book is divided into two parts. The first four chapters illustrate how habits work in the brain and how they can be changed or altered (or not). The last five chapters are really a further study of habits with a focus on practical applications. The most powerful section of the book though is the appendix. It’s in the appendix that the author takes times to illustrate the how of changing or creating habits – in eleven pages. Luckily The Power of Habit isn’t very long or I suspect many a reader would be frustrated that they picked up a book to figure out how to transform their habits and had to wade all the way through to the end to get an answer. And that, truly, is the core of what The Power of Habit is about. When you understand your habits, you have the freedom to control them. Since its original publication nearly thirty years ago, Getting to Yes has helped millions of people learn a better way to negotiate. One of the primary business texts of the modern era, it is based on the work of the Harvard Negotiation Project, a group that deals with all levels of negotiation and conflict resolution. Getting to Yes offers a proven, step-by-step strategy for coming to mutually acceptable agreements in every sort of conflict. Thoroughly updated and revised, it offers readers a straight- forward, universally applicable method for negotiating personal and professional disputes without getting angry-or getting taken. I thought I was a pretty good negotiator. Good, not great. But sufficient. Until I read this book. Boy, do I have a lot to work on! I feel like Getting to Yes will be a book I come back to many times. I found myself reading a section and then stopping and rereading it because the concepts felt so foreign I had to take extra time to process them. The major premise of this book is that the way most people negotiate is flawed. Most of us negotiate in one of two ways: by driving an overly hard bargain to get as much as you can from the other person for the sake of “winning” or negotiating too complacently. The book calls this time of negotiating “positional bargaining”. This book was pretty eye-opening to me and it made me think of the negotiation styles of people I know well and people in power and it did made me realize that the best negotiators I could think of were using the tactics in Getting to Yes. This isn’t a very long book, but it’s definitely a must-read even if you’re not in a sales or negotiation profession. The tips in here are applicable to all kinds of problems. I struggled with this book at first, as I do with almost all biographies. Unless I’m doing research for something, I can feel way too bogged down by all the details. There was also the matter of how Isaacson approached the biography of Steve Jobs. Jobs was obviously a very flawed human being. I think the introduction should have been a little longer, to give the reader more of a warm-up for (the uninitiated) how not nice of a guy Jobs could be at times. I knew he wasn’t a super well liked person, but I didn’t know the full extent of it and not being adequately prepared for it made me struggle to keep reading because I just couldn’t root for him for the longest time. For its flaws, I really began to like the book after we got to the part about Pixar. I think the biography started to hit its stride there, as Jobs did in his life. And the rest of the book was more interesting to me since that is roughly the time period I lived through. I also thought the epilogue to the book was superb. Absolutely superb. I definitely walked away with a greater understanding of Jobs and how his vision informed Apple and all of the products I loved. End-to-end integration wasn’t a term I was familiar with before this book, but I really resonated with that idea. Perhaps because I’m a millennial, I don’t understand how anyone could manage their employees (let alone their millennials) in ways other than through the strategy outlined in Chasing Relevance. Yet they do because I’ve lived it, I’ve seen it, and I keep seeing it. This was a truly fantastic read! 36% of the American workforce is millennials, yet people are still writing articles about how millennials are the worst generation (like this*). It’s a refreshing change of pace to read a book that talks not only about what’s great about millennials, but how to do better in the workplace whether you’re a manager of millennials or millennial employee. Chasing Relevance is divided into two parts. The first is about making over yourself to be a better employee or manager. The second is about the B.R.I.D.G.E. theory of getting over generational gaps to boost employee morale, retention, and productivity. It’s important to take the time to work through each section of the book. The first part is very interactive and requires you to do some external thinking beyond just processing what you’re reading. The second part is a 6-step process that you will probably need to tackle piecemeal, especially if the concepts are really foreign to how you manage and interact with others. As a millennial, I will say this book is completely spot-on. The six steps of B.R.I.D.G.E. are how I manage and also how I like to be managed. I’m not saying I’m naturally perfect at this because I’m a millennial. I’m a human and I struggle to be better in certain areas – particularly with I, D, and G. But I firmly believe this is the best way to get the most out of people. All other methods are problematic pretenders that have no place in the modern workplace.